Adapted in part from Avionics Engineering specification DO-178, this book is a concise step-by-step guide to building and establishing the frameworks and models for the effective management and development of software requirements. It describes what great requirements must look like and who the real audience is for documentation. It then explains how to generate consistent, complete, and accurate requirements in exacting detail following a simple formula across the full life cycle from vague concept to detailed design-ready specifications. 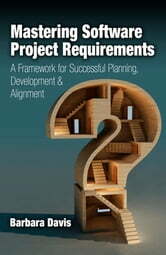 Mastering Software Project Requirements will enable business analysts and project managers to decompose high-level solutions into granular requirements and to elevate their performance through due diligence and the use of better techniques to meet the particular needs of a given project without sacrificing quality, scope, or project schedules.